Insects affect human beings by feeding on all kinds of plants including crop plants, forest trees, medicinal plants and even stored products causing huge amount of loss and also deterioration of food quality.In general, disease is an interaction among the host, parasite and the environment. Plant diseases may be due to pathogenic or non-pathogenic organisms. Pathogenic organisms include fungi, bacteria, fastidious vesicular bacteria, phytoplasmas, spiroplasmas, viruses, viroids, algae, protozoa and phanerogamic parasiteswhereas non-pathogenic diseases are influenced by environmental or non-living factors. Post-harvest losses account for 27-30% of total food produced globally.Due to perishability in nature horticultural crops respire, transpire and ripen upon harvest thus deteriorating the food value of the produce for human consumption.Use of appropriate post-harvest technologies minimizes the post-harvest and storage losses; adds value to the produce, generates rural employment and renovate horti-based industries in the rural sector. Due to availability of a large number of traditional fruits and vegetables in India, there is need to develop protocols for primary processing and crop specific machineries. 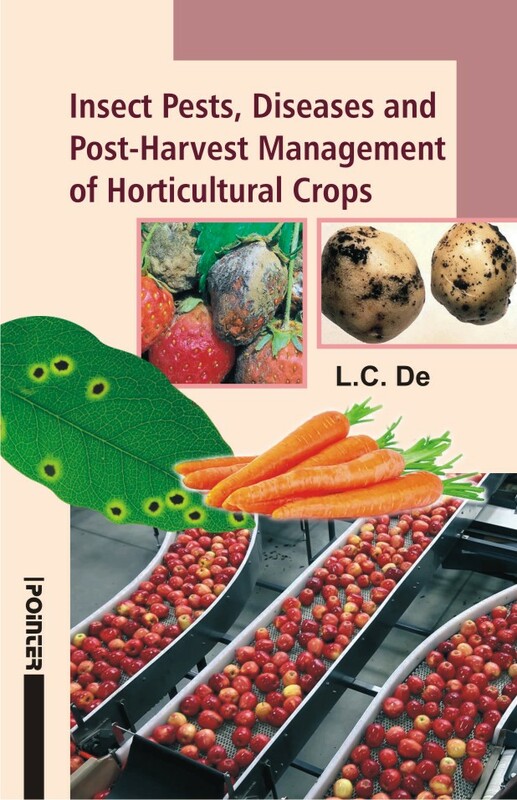 In view of above, the present publication on ‘Insect Pests, Diseases and Post-harvest Management of Horticultural Crops’ is planned in 09 interesting chapters vividly highlighting various aspects covering insect pests and diseases of fruit and plantation crops, insect pests and diseases of vegetables and spices, insects pests and diseases of flowers, medicinal and aromatic plants, harvest and post-harvest handlings in fruit and plantation crops, harvest and post-harvest handlings in vegetable and spices, harvest & post-harvest handlings in flower, medicinal and aromatic plants, processing and value addition in fruit and plantation crops, processing and value addition in vegetables and spices and processing and value addition in flowers, medicinal and aromatic plants. The book will be useful to teachers, students, scientists, nurserymen, landscape designer, planners, amateurs and professional gardeners and above all farmers.